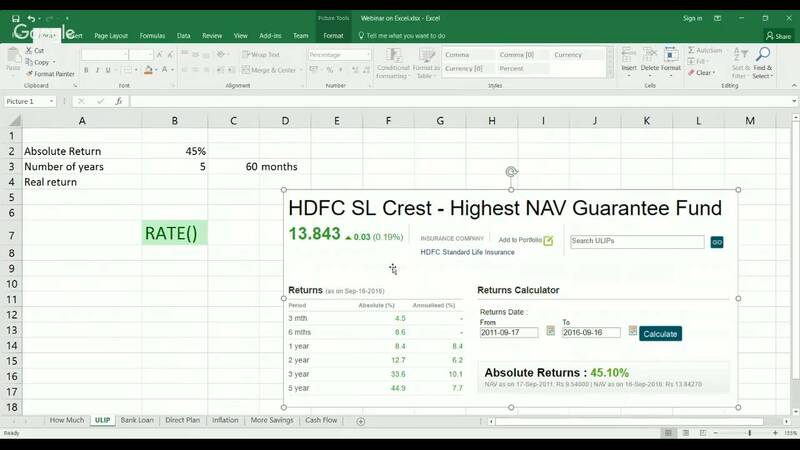 Watch Deepak Shenoy unravel financial jargon through the use of simple Excel formulas that will help you understand when you’re being suckered into a deal. We explain in a simple and easy way, and hope you’ll take away some of the key aspects of managing your own money without getting drawn into bad products. Don’t chase returns, chase discipline: Why you should not focus on the “where to invest” mantra. What does it really mean when someone says you put in Rs. 100,000 per year for 10 years and we’ll give you back 20 lakh rupees after 15 years? Don’t get fooled: Don’t let your bank tell you that you can borrow 10K and only pay back Rs. 1.1K per month for 10 months means a 10% interest – it’s a loan at 21.25% ! This and much more. What would a 1 crore be of value in 20 years? How does that even relate to you today? Excel to the rescue. Get Smarter Returns: How much money will you lose by choosing a Regular Plan over a Direct Plan when investing in Mutual Funds? Saving A Little More: Small daily savings can have a significant impact on your investments. How much? We’ll show you. How to calculate Cashflow from the products like money-back policies, using Excel. Let us know your questions in the comments section. And also here’s the Excel file as a google spreadsheet. You can download it as an Excel file and use it locally. Connect with us at @capitalmind_in on twitter.